We’ve already discussed the hardware of the HTC Hero in our previous review and in short, it’s great. The wonderful build quality and high-end design will certainly make it appealing to tons of users, new and long time smartphone users alike. But what makes the HTC Hero truly special is the software, HTC Sense. 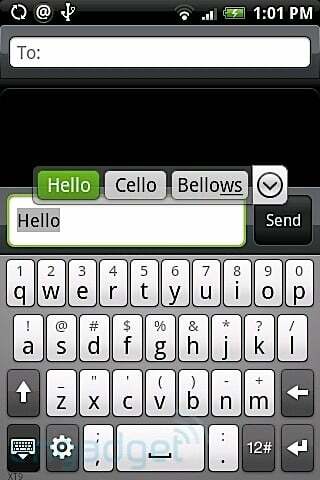 We’ve covered HTC Sense here at Android Central before and have never hidden our feelings about it (we love it). 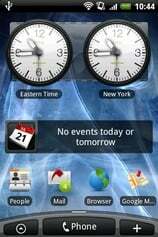 HTC Sense really shows what Android is all about—the customization, the uniqueness, and the capabilities. We think it’s safe to say that HTC Sense was one of the biggest announcements for Android this year—it cast Android in a dynamically new light and showed the world that Android was in fact, ready for the prime time. So how, after all those superlatives, does HTC Sense perform? Is it really the game-changing feature that we’ve built it up to be? Is it speedy? Is it slow? Is it usable? Find out in Android Central’s software review of the HTC Hero! 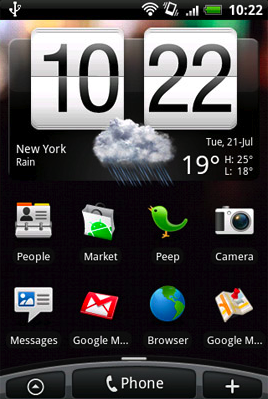 HTC Sense is the software behind the HTC Hero. To put it simply, it’s a widget-based UI that combines all kinds of customization and sexiness. HTC has built a lot of apps and widgets for Sense and they’re all drool-worthy. It’s obvious that a lot of work has been put into Sense but it comes to no surprise since HTC has been a staunch supporter of Android since launch--building custom software on top of Android simply extends that thought. HTC even has plans to launch Sense on upcoming HTC Android handsets. So for those users coming from different smartphone platforms, you can liken HTC Sense to TouchFLO 3D on Windows Mobile (but better), a crazy theme on steroids for Blackberry (but more in depth) and for well iPhone users, you guys don’t get to customize so you have no idea how cool this is (really cool). Before we get started, let’s put this dirty rumor to rest. The HTC Hero is not overly laggy or slow, in our own experience with it, it is completely fine. We never encountered a hair-pulling, finger scratching, throw your phone across the room slowdown nor did we notice it to be any slower than the stock Android build. It looks like the updated firmware worked wonders on it. We’re sure most of you will agree. 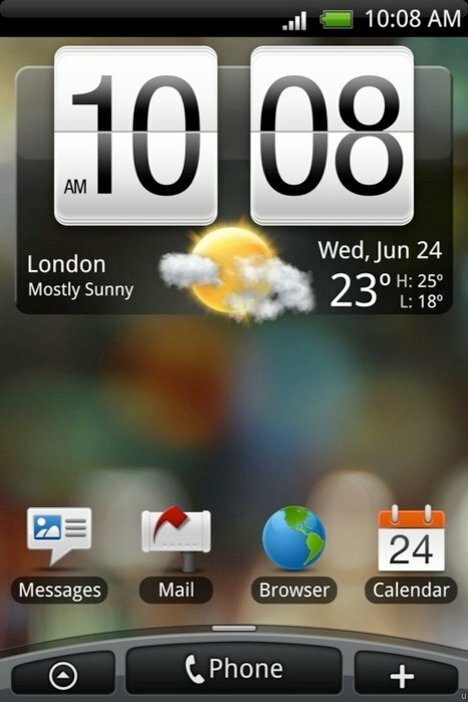 HTC Sense provides users with 7 home screens (as opposed to just 3 in stock Android) to place all your widgets and shortcuts in whatever order you so please. Those 7 home screens come together to what HTC calls ‘Scenes’, Scenes basically allows you to switch out your entire home screen for different needs. For example, in the work Scene, there’s work-related widgets like stocks, calendars, e-mail, etc loaded on and in the social Scene, there’s twitter and messaging widgets. Scenes are completely customizable and can be saved for future use. We think Scenes is a great and novel idea because you can basically turn your phone into whichever ‘mode’ you need. Going to work? Fire up your ‘work' Scene. Going on a vacation? 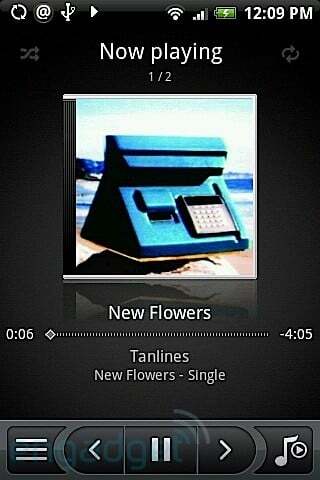 Dial up the ‘play’ Scene. It’s quick customization at its very best—allowing one phone to maintain multiple personalities. 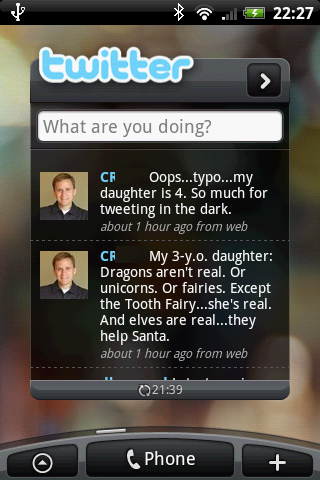 HTC Sense relies heavily on widgets and as any self-respecting Android user knows, widgets are just awesome. Widgets provide instant information to your homescreen, what’s the latest tweet from your twitter feed, how your stocks are doing, the weather, etc., there’s no app you have to jump into. Widgets are about giving you as much information as you can take without having to access the app. It’s really a very dynamic experience that adds much needed depth to the home screen. 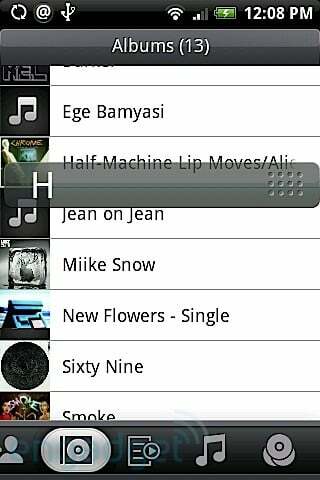 And of course, HTC Sense plays into your social networks. Sense allows you to link your Contacts with their Facebook and Flickr accounts. It’s not as in your face as the Motorola CLIQ, but it works pretty well. It does a wonderful job in creating a seamless experience that ties all your networks together. So when scrolling down your Contact list don’t be surprised when you see their latest Facebook status update. Great ideas, no? HTC went and designed their own widgets for Sense and to say it’s nothing short of beautiful would be a crime. 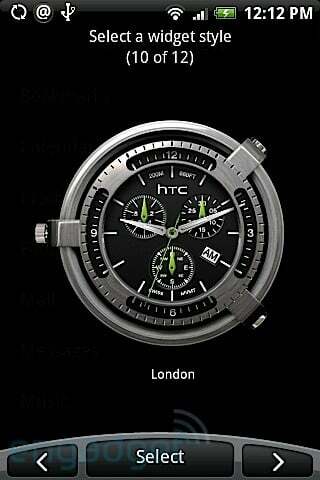 And not only do they look great, the HTC widgets are highly useful and practical. There’s widgets for simply everything—bookmarks, calendar, clocks, mail, messages, music, people, photos, search, settings, stocks, twitter, weather, etc—it’s an almost overwhelming list of items that add information and prettiness to your home screen. What makes the HTC Widgets even better is that most widget categories come with different widget designs—you’ll eventually find something useful for your style. 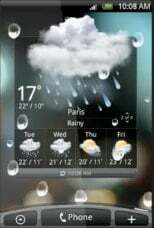 Essentially for each widget category, the options are big and beautiful, normal and useful, or small and to the point. You can find your balance. Because there are so many widgets to pick from, having the 7 home screens really shines—you can load as many widgets as you feel just. Like we said before, the widgets offer a much more in-depth home screen experience—you’re no longer viewing the home screen as a mere app launcher because it’s now your weather report, twitter application, and media player in one. However you want, whichever way you like. 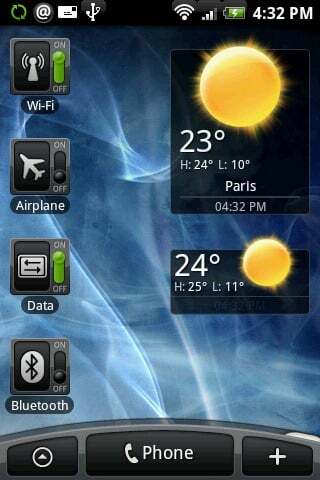 HTC also offers widgets for turning on/off airplane mode, Bluetooth, gps, mobile network, and Wi-Fi. 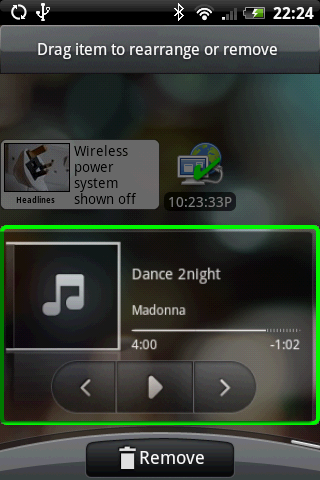 We told you HTC Sense extends your home screen functionality. You’re going to love these widgets. It’s really wonderful to see manufacturers take social networking seriously and offer ways to create a seamless experience with our mobile devices. Our phones of today aren’t just dialing machines, they’re an extension of our everyday lives (at least our lives on the web). We dare say that the phone feature may be dropping down on the list of most-used applications as our smartphones get, well, smarter. 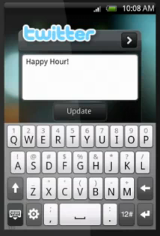 And HTC Sense’s play into social networks emphasizes this change. Your Contacts are much more than just phone numbers. They’re becoming a way to keep track of Facebook status updates and events, Flickr photo albums, SMS conversations, e-mails, birthdays and notes. Judging by the order of the tabs in contacts: Information, SMS, E-Mail, Facebook, Flickr, and Call History—we can see that HTC is acknowledging, heck even embracing the change in how we communicate. And we love it. Our phones are better equipped to serve our needs and offers multiple ways to connect to each other—in HTC Sense, you’re allowed to be more than your phone number. What’s interesting is that HTC didn’t include Twitter or Google Talk integration to their contacts. And though we initially disagreed with their choice, we’ve come around to it and believe that HTC made the right move. Twitter and Google Talk are much more immersive forms of communication—having a dedicated app for those services offer a more dynamic and thus, better experience. 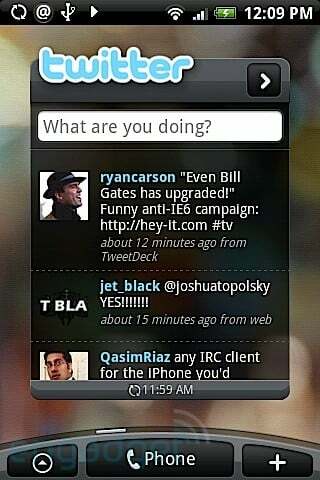 So instead of just linking Twitter to your Contacts, you get to use Peep, a HTC-built Twitter application complete with a beautiful widget. Peep isn’t going to be feature-rich enough for ‘pro’ Twitter users but for the rest of us, it works just fine. 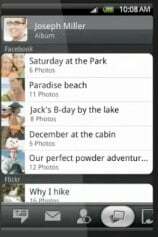 Sadly, there’s no HTC-built Facebook application, you’ll have to rely on Android Market for that. 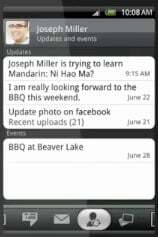 We like the Social Network integration with HTC Sense, it combines the experience of connectivity without feeling forced. Yes, Social Networks has been the buzzword for years now but not all users may find a need for it. 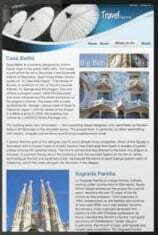 It’s convenient enough for those living active social network-lives to use and small enough for those who’ve never heard of TwiBookfaceflick to leave unused. So while it hits the bullet point of Social Network connectivity, it keeps the scope of HTC Sense broad—you don’t have to have a social network to enjoy Sense. In the end, the Social Network integration is a side feature done really, really well. The Browser in the Hero is the same good stuff that we’ve come to expect from our typical Android browser with the added benefit of two new features: multitouch and flash support. 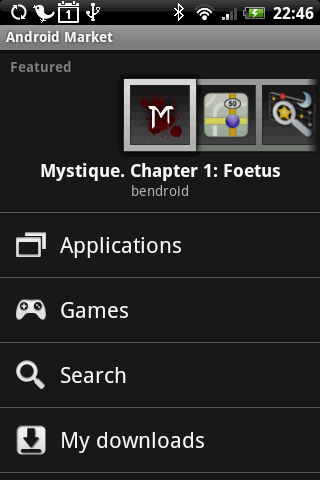 Yep, finally, multitouch on an Android device! To put it as simply as we can, multitouch in the browser is stupendously sweet. It makes infinitely more sense than the typical plus/minus symbols we’ve been using and works so much better. What makes the multitouch implementation even cooler is that instead of your run of the mill zoom in, zoom out via pinching out, pinching in—the text of the website resizes when you zoom in/out, making it easier to read. 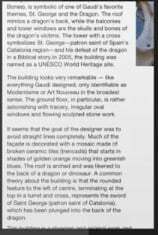 It’s a smart way to read text heavy web pages on a mobile screen. When you zoom in, the text justifies itself and fits to screen—no need to constantly scroll right and left. Smarter multitouch--it's like magic. On the other hand, Flash support isn’t nearly as polished. It’s nice to see Flash every once in a while on websites but don’t even dare to fire up Hulu. As it stands now, either Flash isn’t fast enough for our mobile processors and 3g networks or our mobile processors and 3g networks aren’t fast enough for Flash. Who knows who's to blame. We’ll probably have to wait for the official Adobe solution for Flash to become useful on mobile devices. Let’s face it, the browser in stock Android is already wonderful. So to have the Hero add multitouch and flash support (however disappointing it is) to the mix makes it even better. 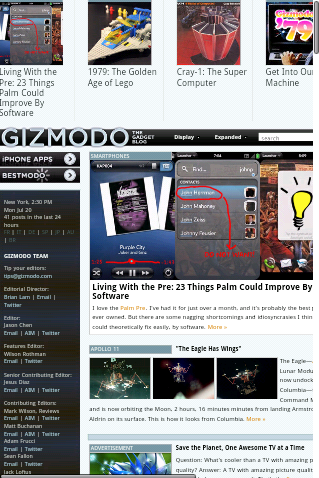 As hard as it is to make one of the best mobile browsing experiences better, they did it. If you’re on a myTouch 3G or T-Mobile G1, you’ll be jealous of what the Hero browser can do and immediately demand the Android team to add multitouch immediately. We guarantee it. One of the few features you’ll have to give up on when moving to the Hero is a physical keyboard. Luckily, HTC has built a custom keyboard that offers a slightly better experience than the stock Android one (not to mention it looks better). The keyboard has the right sensitivity, a logical button arrangement and a lot of in-depth action via long presses. If you’re familiar with the Android soft-keyboard (or iPhone keyboard), you’ll notice that the Numbers button (to bring up numbers and symbols) is on the opposite side and the icon is a lot smaller than we’re used to. The switch and smaller size doesn’t inhibit experience too much, you’ll just have to accept it for what it is and type away. For those wary of moving from a physical keyboard to a soft keyboard, trust us, we’ve been there. You’ll grow used to it and love the larger screen real estate gained from not being trapped with a physical keyboard. There’s a 3.5mm headphone jack and a slick onboard media player, these two features alone make it the best media device for Android ever. 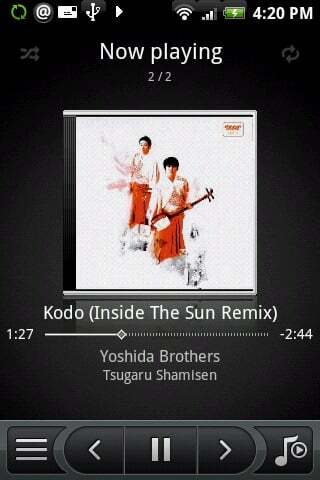 The UI looks as pretty as you’d want and works as well as you’d imagine. The only downer is that there’s still no syncing solution for Android, so you’re left dragging and dropping music onto your Hero, definitely not ideal. Because the HTC Hero is on Sprint and because Sprint loves to load a bunch of carrier apps on its phones, you’ll find a lot of Sprint applications on your Hero. And though the Sprint widgets and apps aren’t nearly as polished as the HTC-built ones, we’d have to say Sprint does offer better applications than your run-of-the-mill carrier apps. You get Sprint TV, NFL Mobile Live, NASCAR Sprint Cup, and Sprint Navigation whether you like it or not. And though we all have our varying interests, the Sprint Apps are invisible enough to ignore and if you happen to be a big NFL or NASCAR fan, you’ll be hard pressed to find a better mobile experience on a different carrier. As hidden as Android seems on the HTC Hero, make no mistake, this is still an Android phone. That means you get all the goodies of Android—Gmail, Android Market, Google Talk, Google Maps, the notification window, the openness, etc.—and all the goodies are still great. If you love Android, this is still Android. If you’ve never used Android, meet Android. Sadly, the Sprint HTC Hero ships with Android 1.5 ‘Cupcake’ and not Android 1.6 ‘Donut’ which means all these new Android users don’t get to immediately enjoy the new and unique features of ‘Donut’. We’re definitely disappointed that ‘Donut’ didn’t make its way onto the Hero not only because it’s a better build of Android and has new features but because we simply don’t know when it’s coming to the HTC Hero. We’ve been given no timeline from Sprint and we’d hate to see a batch of Android users (new ones, to boot) be stuck on 1.5, when 1.6 already exists. 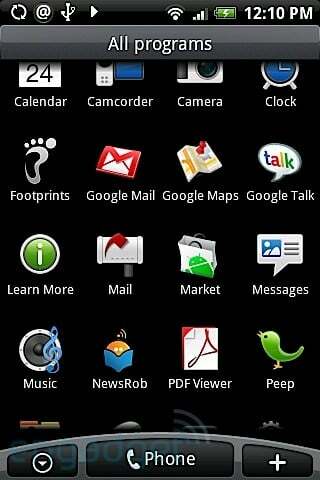 The software on the HTC Hero rocks. 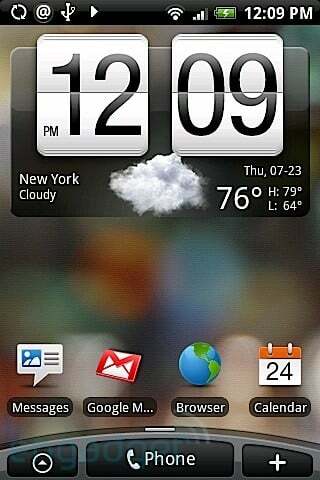 This is truly Android grown up and we absolutely love HTC Sense—it’s beautiful, still customizable, and so easy to use. You’ll get great new features (widgets, social network) that simply add to the Android Experience and truly make Android a ‘top-tier’ platform and the HTC Hero a ‘top-tier’ phone. If you’re a Sprint customer, this is your new best phone. If you’re new to Android, there’s no introduction like the HTC Hero. We believe that you’ll be stunned at how easy it is to use and how polished it all works. If you’re looking from the myTouch 3G or T-Mobile G1, you can’t help but be jealous of the Hero. 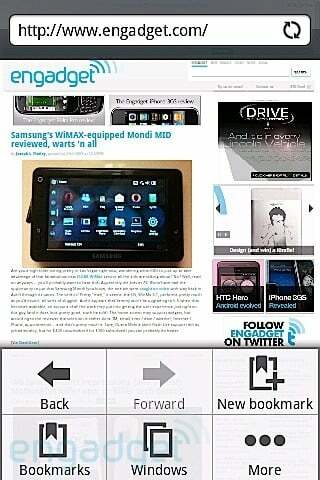 The UI offers a great experience while still maintaining the same lovely Android and even adds a better browser! We have no hesitation in saying that the HTC Hero is the best Android phone available and after using HTC Sense, will be for quite some time. If you’re planning to buy a smartphone, your only legitimate excuse is if Sprint doesn’t get good reception where you live. But from our experience with Sprint (this was our first), the flack that it catches is undeserved. The network was strong, the data speeds were fast and even the carrier apps were surprisingly useful. And unbeknownst to us, their smartphone rate plans are on the more affordable end. Either way, we think the HTC Hero is a strong enough option to consider switching to Sprint. It’s that good, inside and out.